By: Shawn C Baker on 10/11/2012. I was really into this at the time. Looking back I pretty much cannot see past the art – as it is not good – but I was indeed into it. Why? 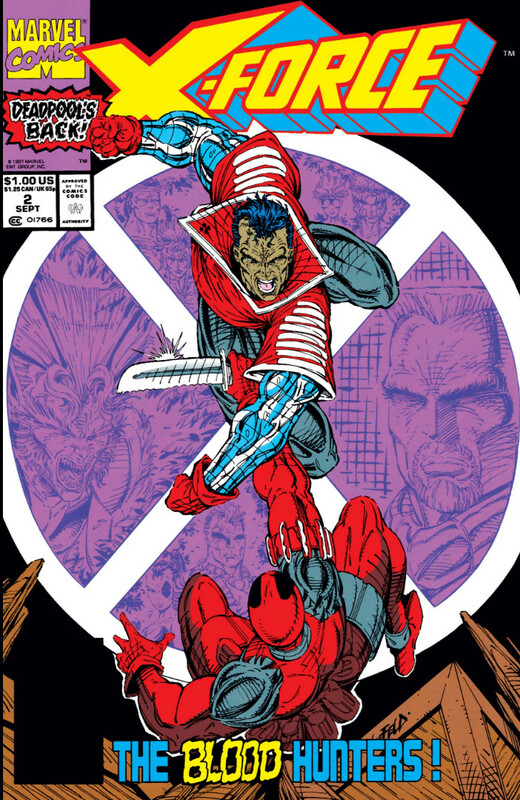 Well, in trying to ascertain just that I’ve realized that in spite of the exaggerated proportions and faulty anatomy, hyperbolic weapons and just plain awful layouts of this era (and especially Mr. Liefeld’s work) the one thing that books like X-Factor had was that visually they were something different. This is the root of the phenomenon that was Image (only one book really had anything different to offer in the way of story and that was Sam Keith’s still amazing The Maxx, a column for another time) and while it worked for a while it eventually imploded and taught the industry – and many of us readers – one very important lesson. No matter the state of the art, without good writing you will not last. While I was in Chicago recently my Father revealed a hidden cache of many of my old toys and comics and among these I found my collection of the first twenty-something issues of X-Force. Despite my hatred of the art and the pretty much ridiculous story of these books I still from time to time find myself fondly remembering some of the rather interesting twists and turns of Cable and his young crew’s lives in 1991/92 and I brought the first thirteen back home to LALA land with me to re-read for the first time in twenty years. The stuff I remember liking strikes me now as the general Chris Claremont-esque revelations that plotter Liefeld and scripter Fabian Nicezia dropped on the team’s head week after week. The intrigue as to just who Cable was and what lengths he’d go to in order to fulfill his personal vendettas escalated in a pretty thrilling fashion – if you read it you no doubt remember the mind-blower when he skewered and killed Morlock leader Masque for ignoring his warning to stay out of their home – and always left the audience wondering just how expendable his little teen soldiers were, exactly. However what kills these droplets of interest is the incessant need for rapid-fire action and TA-DA moments that literally force the book to implode on itself almost every issue, as a simple rule of plotting seems ignored: not every issue can be a page-turner! Stories need movements and movements require varying tempos. What’s an album worth of songs that NEVER let up? Well, unless it’s Slayer’s classic Reign In Blood (which is twenty-nine minutes and three seconds FOR A REASON) it’s probably a bore. Same goes for my experience now re-reading these issue of X-Force. It’s just too much. Still, I’m plodding my way through, enjoying little moments here and there, buried within the detritus. Tolliver really Cable’s son? Sam a High-Lord? Yeah, most of it is common comic book twisty crap, but it left an impression I can now somewhat enjoy as nostalgia, when I tire of reading the “good” or “literate” books that today are my regular fare. And seriously, that’s one good thing came of 1991, the Image guys and dye-cut covers*: it taught us all the importance of THE WRITING of comic books over THE ART of comic books. Not to berate the artists, but art alone… it just doesn’t carry the lack of story. That’s why the next big paradigm shift within the industry, spear-headed by the likes of Brian Michael Bendis, Garth Ennis, Mark Millar and Grant Morrison, would put the emphasis back on the writing and less on the need for blockbuster art. So nineteen-hundred and ninety-nine did serve a very great purpose – it may have even saved comic books and made them what they are today – mainstream pop culture building blocks. Don’t believe me? Walking Dead. The Avengers. The Dark Knight. Watchmen. V for Vendetta. And many, many more tv shows and movies to come!!! Now, fancy a pint? I’ve got some Köstritzer Black Lager in the refrigerator I’m going to require if I’m going to try to read anymore of these X-Force tonight. Cheers!